Today I spent around 6 hours or so working on the two cigar box ukulele kits. As I previously mentioned, I am building two kits --- one all the way to the completed ukulele, and the other just to the point of the basic kit parts (the kit the students will receive). Here I am using the fret-slotting miter box, along with the fret scale template (which has indexing notches on one side for the 13.75" soprano uke scale I am using for this project), to cut the fret slots with a Japanese pull saw. First, I stick the bloodwood fretboard to the metal fret scale template with double-stick tape, and then slide the template into the miter box. There is an indexing pin in the front inside wall of the box, just to the left of the cutting area. (I have already adjusted the bearings for the desired depth of cut.) I place the template so the pin engages the first notch of the template (which represents the nut end of the fretboard) and saw my first slot. Then I slide the template to the next notch and I saw that slot --- that cut will be the first fret. And I just continue on from there, until all 13 slots have been sawn. The result: an accurately slotted fretboard. After I remove the fretboard from the template, I saw all the way through that very first slot (which was the nut slot). TO THE LEFT: I then tapered the fretboards --- making them 1-3/8" wide at the nut end, down to 1-3/4" at the 12th fret. 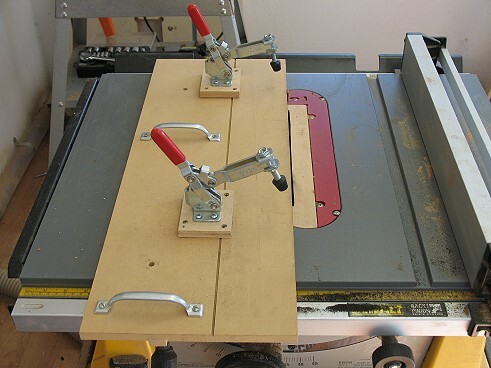 As these fretboards were too short to be clamped down in my fingerboard taper jig for the table saw, I had to just cut the taper with my bandsaw and fine-tune the cut with my disc sander. I also cut and sanded a rounded edge at the bottom end. TO THE RIGHT: Finally, I cut the neck blank ends at the 12th fret position and drew the fretboard shape onto the blank. That's all for today....More tomorrow!